We are looking for talented people to join our team who are just as passionate about plants as we are! Are you someone that wants to be fit, but doesn’t want to go to the gym? Does the smell of fresh flowers and the idea of being one with nature interest you? Are you someone that enjoys working with plants and people? Then look no further, we have the job for you! For the Love of Plants!!!! Every season has its own unique qualities that makes them stand out from each other! Spring’s unique quality is giving us a taste into spring before it happens. We can all use a taste of green, especially this time of the year. It’s important to find love and happiness in every situation. Today, we want to help add to your love and happiness with a taste of what is growing in our greenhouse and spread the love of plants. Plants are amazing creatures that bring us joy and companionship. Much like a pet they provide a sense of responsibility. When they are doing well we thrive on the happiness of our success and when they are struggling we research and do everything we can to make them feel better. Plants make life possible. Period. Besides providing mental and physical happiness they also make it possible for us to survive on earth. Houseplants help improve the air quality by absorbing toxins, producing oxygen for us to breathe, and increasing humidity. Plants help us see things differently. They help us recognize that the world is full of new possibilities that are much bigger than we are. They fill us with love, providing us with partnership. Plants let us know what they need and in turn we adapt putting their needs before our own. From one plant friend to another, Happy Heart Day! Come on in and beat the brutality of winter. We want to share what we have growing for you in our greenhouse! This time of the year can be hard for plant people, not having the ability to get outside and dig in the dirt. So, we want to share some green with you. The Easter Lily is the ultimate Spring plant. Every year we grow this beautiful plant as a reminder of a new year and a new start. It symbolizes the start of something new. Change can be scary, but as they look so fresh and green you can’t help but smile and feel good! The Ranunculus is a newer plant to us. This will be our third year growing them and each year they get even more beautiful. 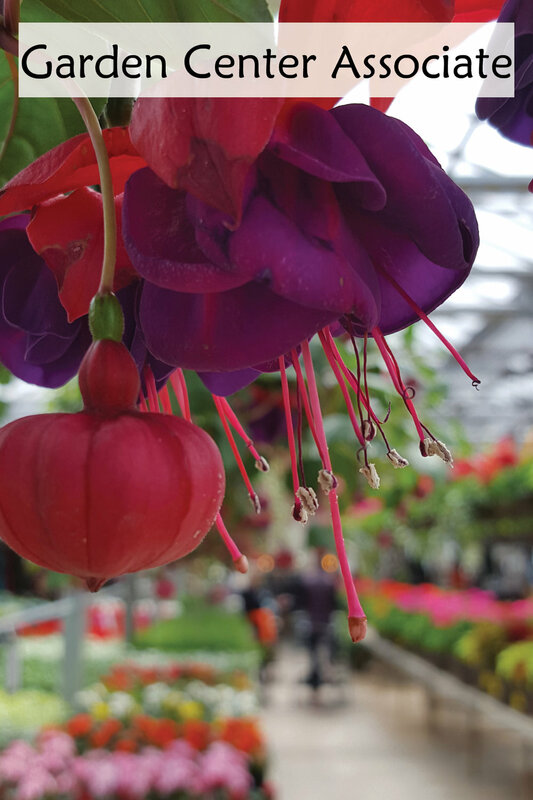 If you are familiar with this plant, we are sure you have admired their stunning, bold color. Even though there is no color yet, just you wait. Soon they will be bursting with color. P.S. Can you smell the fresh soil?? The Hydrangea is known for its vibrant pink blooms. ‘Pretty in Pink’ is putting it lightly don’t you think? This plant has it all: volume, color, and structure. Built on sturdy stems the Hydrangea produces big flower heads of many shades of pink. It makes for the perfect gift for any spring plant lover. When everyone works together it’s amazing what can get accomplished. When you look down a bench full of plant material in our greenhouse you would never realize how many people it took to make that happen. Our production and growing crews work together as a team to make all this possible. Go Team! Go Green! Don’t mind us as we continue to plant happiness! Get through the cold and think spring!! On these brutally cold days it’s fun to image being somewhere warm and tropical. But for us Minnesotans that can be hard with single digit temperatures on the horizon. Our Northside greenhouse may not be tropical, but it is definitely warm; warm enough to grow Easter Lilies!! What a difference a couple of weeks make! You can see the astounding growth from Jan. 9 - 21. We start off our Easter Lilies from bulb. 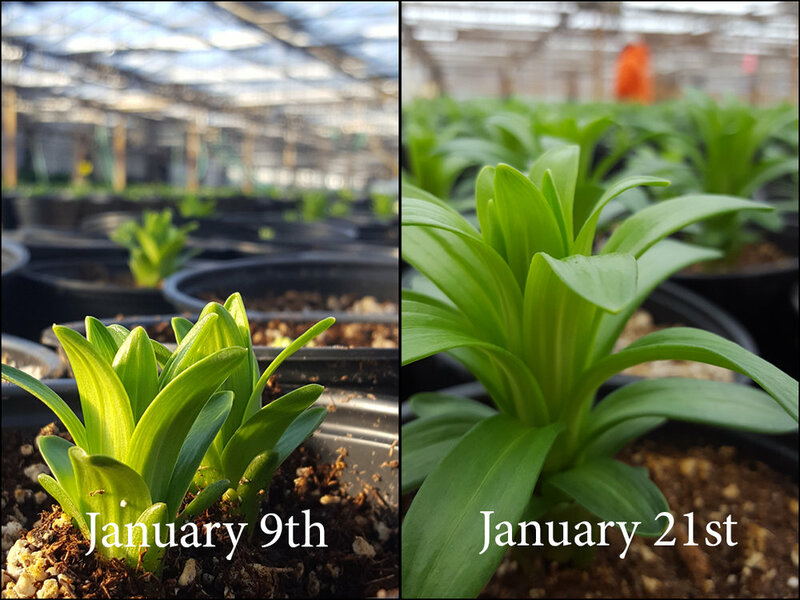 Our growers then have the control to change things like temperature and sunlight helping each Easter Lily reach it’s full potential in time for spring. Easter lilies are grown in 4 stages. 1. Emergence, 2. Flower Bud Initiation, 3. Visible Bud, and 4. Open Flower. We are now headed into stage 2. Flower Bud Initiation. This is when the plant develops stem roots, the first sign of bud initiation. These roots then help the development of bud growth. Fun Fact: The first visible flower buds are so small you need a magnifying glass to look for them. The flower bud that is developed with the help of stem roots form at the base of the stem and over time pushes its way to the top creating a visible flower bud, which is stage 3. 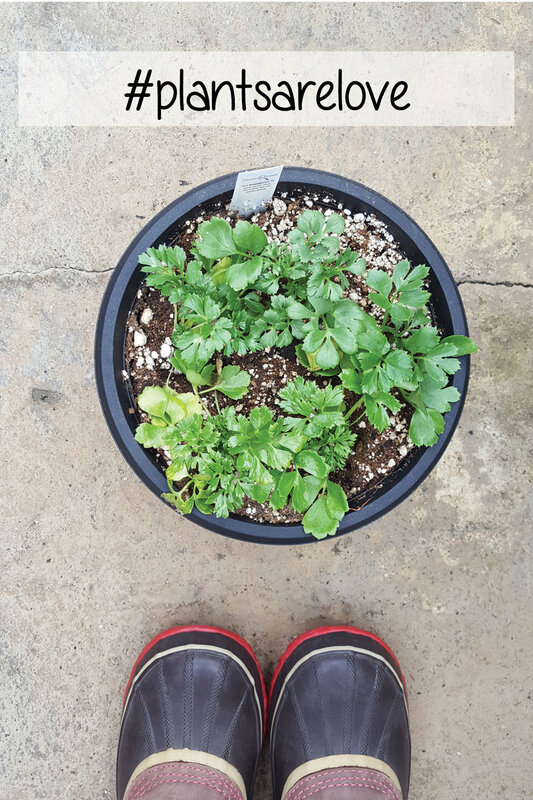 Spring is one of four seasons that brings new growth and green to our greenhouse. We hope this article warmed you up a little. Living in Minnesota we can all agree that it’s no surprise that we spend most of our time indoors during the winter, but this holds true all year round. On average Americans spend about 22 hours indoors a day. Now if you are a gardener or a plant enthusiast, this probably does not hold true for you. Bur for most of us we are spending time at home, in our cars, and at work indoors. While it might not be realistic to change our routine and get outdoors there are ways to bring a little bit of nature inside. How do we do this you might ask?? When we buy our first houseplant we don’t really realize what we are getting ourselves into. One turns into two, two turns into three, and before you know it all your windows are filled with a variety of plants and we are calling ourselves plant parents. Even when we think there is no more space, we always make space. Discover the Benefits of Houseplants!! For those who have houseplants, you can relate to the bond that is created when owning them. We take pride in the fact we can take care of something and keep it alive. It never amazes me how plants can have different personalities. Depending on their light requirement, water intake, or foliage type each plant acts a little different. I think we all can relate to the types of plants that sit there and look dangerous. You know… cactus. They don’t require a whole lot of attention and that’s why they are great to have on a sunny windowsill and let them be. It’s great to maybe sometime forget about them but come back to a happy plant nonetheless. That’s what makes cacti so great: their lack of needing water. Which brings us to our next plant type. The sit there and look pretty plant: succulents! Succulents are a lot of fun, but sometimes can be tricky. They absolutely love the sun and can’t seem to get enough of it. Like the cactus they don’t require a lot of water either, which makes them great plant starters for new plant owners that are busy. However, too much water and you have an over-watered plant that just can’t seem to recover. Note to self: there is such a thing as loving your plants too much! Finding the right watering regimen is probably the trickiest part as a new plant owner. It’s all about getting to know your plant and what it likes. “How often should I water? ?” It’s the dreaded question we as retail team members struggle with, because it all depends on where you put it in your house. Window or no window, draft or no draft, a lot of light or no light, what your house temperature is normally, and so on. Discover our H2O Grow water! Alongside your watering regimen knowing how much water to provide at a time is another factor. This heavily depends on the container size. If you have a small container with a foliage plant, you don’t want to water excessively and run the risk of standing water. Someone once told me that you should water about ¼ of the container size. And of course, it goes even deeper when you have different plants that prefer different amounts of water. There are so many variables that decide how often you should water. For example, on average, and this is a rough estimate, I water most of my foliage plants every other day and my succulents every 4 days. I say this is a rough estimate because certain plants dry out faster than others and I have a wonderful sunny window, so my cacti and succulents get a lot of sun. However, all this can change depending on the temperature. A cooler temperature requires me to water less frequently. So, you can see there are a lot of factors that play into being a plant owner. I wanted to share my plant parenthood journey with all of you because it’s fun to learn what other people do and how we take care of our plants differently. Most of my plants have been with me for a year or greater. I have been able to get to know my plants and they have also helped me discover what they prefer. Owning and taking care of plants can be a great accomplishment and I wanted to share what I discovered along the way. Discover other ways to bring nature indoors! Take a few moments to comment below and explain your houseplant process, if you have any questions on the types of plants you see in the photos, or if you have questions on my watering schedule. Remember: Every plant has a different personality so take a couple weeks to discover what they are like.